The Sacred Heart heritage that has been passed down for generations at Sacred Heart schools around the world. Our Sacred Heart traditions — many of which are shared with our sister and brother schools — are how we pray, celebrate, and build community. Our school teams are the Chargers, and our mascot is a white mustang affectionately known as Cha-Cha. Our team colors are navy and gold. Common rally cries you'll hear at athletic events are Go Chargers! and Hooves Up! Of all our traditions, Congé (kon-zhay) might be our most beloved. Once a year, on what seems like an ordinary school day, the announcement of "It's Congé!" — which means "leave taking" — sends the entire school into a whirlwind of activity. All classes are cancelled, and instead, a full day of fun, games, and socializing prevails. DuchesneConnect is our online community portal. By accessing DuchesneConnect, parents, students, and faculty/staff can update their contact information, search the online directories, and access a variety of resources. We use lots of French at Duchesne, but this one is Spanish for "space." Every day at 9:58 a.m., the entire school stops for two minutes of silence and personal reflection. Some girls pray, some meditate, some just take deep breaths. It is a reminder for us to slow down, relax, and be in the moment before going on with the rest of our day. This is one of our favorites. Goûter (goo-tay) means "to taste" in French, and it is an extra-special snack the school provides for us on special occasions such as Feast Days or other celebrations. The Network of Sacred Heart Schools is an association of 24 Sacred Heart schools across the United States and Canada. There are also Sacred Heart schools in 44 countries. Together, they are dedicated to the values of Christian education articulated by the foundress of the Society of the Sacred Heart, Saint Madeleine Sophie Barat. It is important to us as a community to take the time to recognize each other—our accomplishments and hard work and good choices. On Prize Day, we get to appreciate not only each other's academic achievements but also values we hold dear at Duchesne: community, kindness, and friendship. The term Religious refers to the nuns who serve in the schools of the Society of the Sacred Heart. The Religious of the Sacred Heart sign their names followed by "RSCJ," which is derived from the French Religieuses du Sacré Coeur de Jesus. At Duchesne, the Religious live on campus in the White House. Beginning in Pre-K3, students actively complete projects to serve others throughout our local community and beyond. In Upper School, juniors and seniors fan out across the city each week to work in schools, hospitals, retirements homes, and nonprofits that work with underserved people. The White House at Duchesne is the home of the Religious of the Sacred Heart. The original White House was where classes were held during the early years of the school. Today, it also serves as a space for school events and the backdrop for our graduation ceremony held on our front lawn. This is our shorthand for Goal V, and we put it into practice just about every day. Wise freedom means getting the opportunity to manage your own time and taking responsibility for your choices in an environment that is loving and caring. For the sake of one child, I would have founded the Society. The following Feast Days are particularly special on campus. We celebrate with all-school Masses, as well as special Sacred Heart traditions such as goûter. In 1844, a young novice of the Society of the Sacred Heart painted a fresco of the Virgin Mary on a wall of the convent. The novice painted Mary as a young woman in a rose-colored dress. A lily at Mary's side represented her purity; the distaff and spindle, her love of work; a book, her dedication to study. When viewing the fresco for the first time, Pope Pius IX proclaimed, "Mater Admirabilis!" (Latin for "Mother Most Admirable"). A statue or painting of Mater is in each of the Sacred Heart schools today. This special day is marked with liturgical celebrations and pink goûter (special snacks). 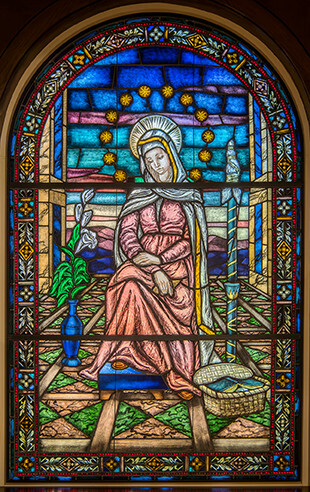 Saint Rose Philippine Duchesne was born in Grenoble, an ancient city in the French Alps, in 1769. 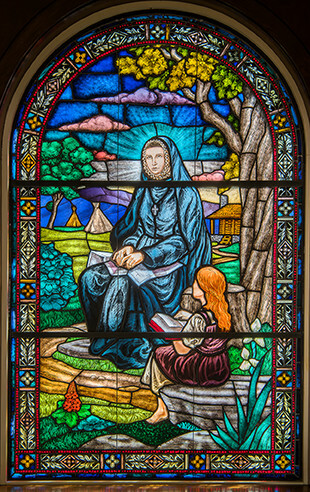 Educated at home and at the Visitation Monastery near her home, Philippine entered the Society of the Sacred Heart in 1804. Philippine's greatest desire was to be a missionary to the United States and serve the Native Americans. In 1818, Mother Sophie Barat consented to Philippine's many requests. On May 29 of that year, Philippine and four companions established the first free school for girls west of the Mississippi in St. Charles, Missouri. Philippine died on November 18, 1852, at the age of 83 in St. Charles. She was canonized in July 1988. Saint Madeleine Sophie Barat, foundress of the Society of the Sacred Heart, was born in Joigny, France, in 1779. She received a remarkable education at home from her Jesuit-educated brother. At 16, she and her brother studied together in Paris. While there, she learned of plans to form a new religious congregation that was to be rooted in prayer, dedicated to education, and, ultimately, committed to glorifying the Heart of Christ. 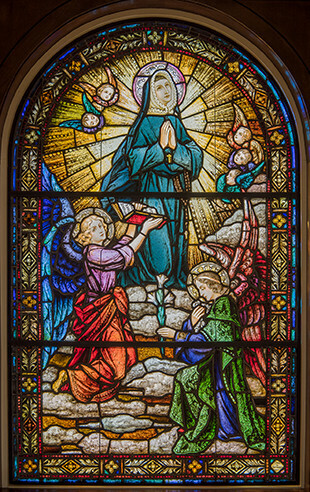 In 1800, with three others, she consecrated her life "to make known the revelation of God's love, whose source and symbol is the Heart of Christ." Elected Superior General in 1806, she held this post until her death on May 25, 1865. She was canonized a saint in 1925.